Seven days until Christmas ! Today is Christmas in the family room..
On the chalk painted buffet..There is a book page tree ..a pedestal plate with thrift store putz houses...mason jars with Christmas lights ..a lantern with lights and greens .. Country Cottage Needleworks Silent Night framed on a thrift store sweater in a thrift store frame..Those sparkly reindeer came from Gordman's this year ...Aren't they pretty ! The view from the kitchen ..the mantel and the snowman tree..and the Scrapbook tree. 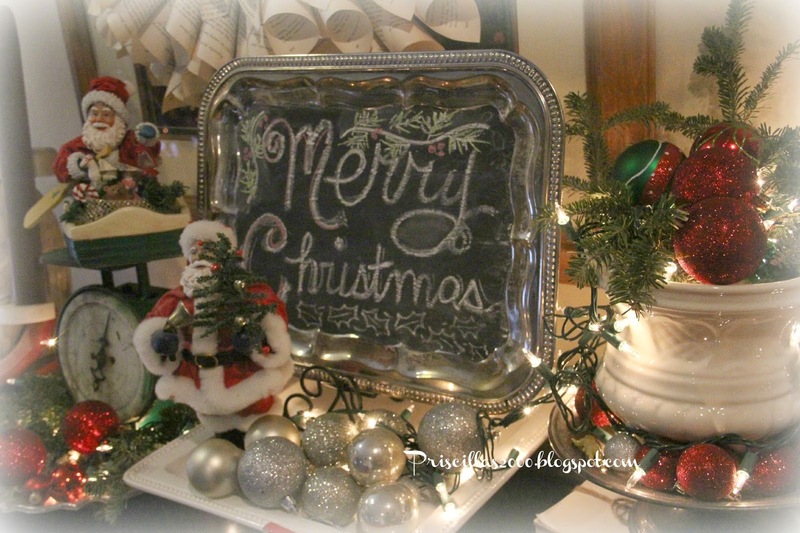 The mantel with the Home for Christmas Chalkboard, an all the cross stitched stockings.. 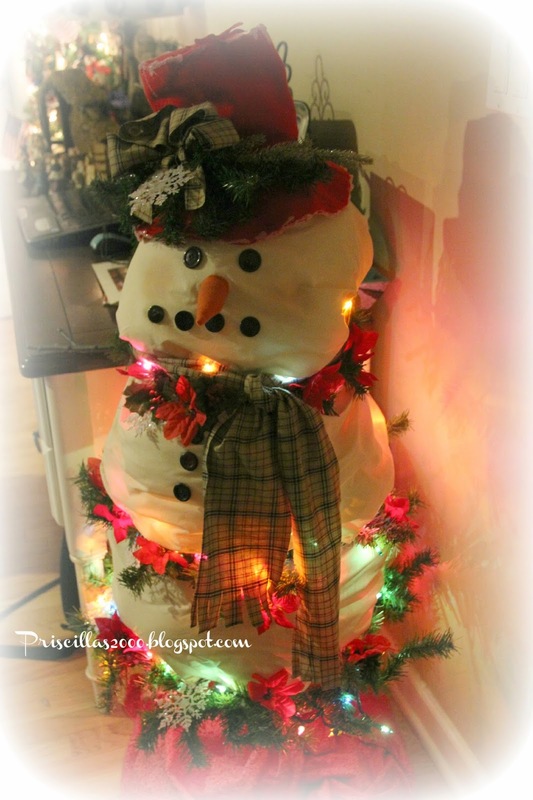 This snowman tree is made on a 4ft tree.. I used muslin and stuffing to make the balls for the tree...This year I cut a piece of plaid homespun for the scarf and made a bow for the hat..There is one strand of lights draped on the branches..
On the coffee table.. 3 sparkly houses in a tray with Dollar Tree ornaments and silver branches.. The Americana Tree is also in the family room..
See you tomorrow with the living room ! Priscilla! Have I told you how you're killing me? 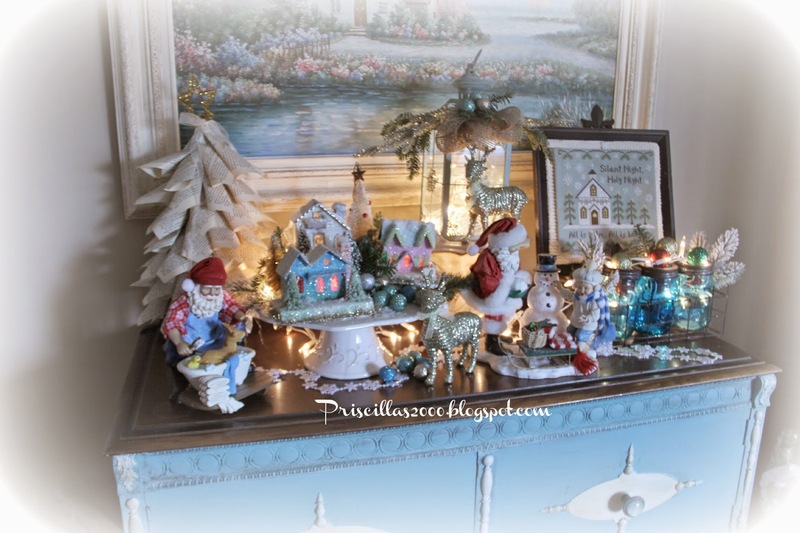 :) Your home is the most enchanting place in all of blogland! I just love everything you've done. I'll be back. 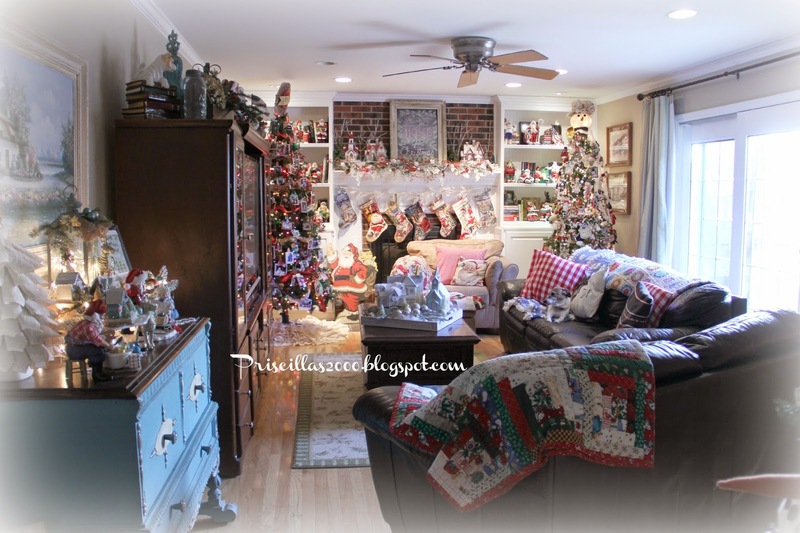 Very beautiful looks your family room...and so warm, cozy and inviting to spend lots of family times now for the C'mas holidays; the most beautiful time of the year. I love your tree and decorations. Merry C'mas to you and yours. Hi Priscilla! I love the chalky buffet! That is my favorite - that and the villages! I love everything. But if I could pick my favorites... 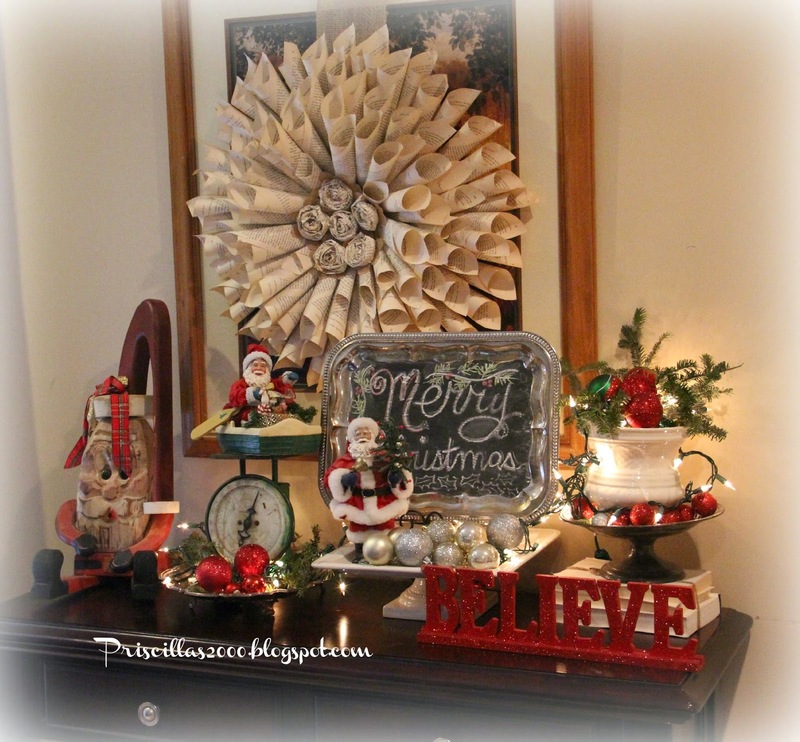 I tried to check your old blogs to find out how to make that coffee filter wreath. I couldn't quite make out how you were folding and gluing those onto the straw wreath in the pix. If you're of the mind to send those instructions, would you send to timandjannie@comcast.net? What will I do when you and Vonna aren't blogging all this wonderful stuff?!!!! Just beautiful. 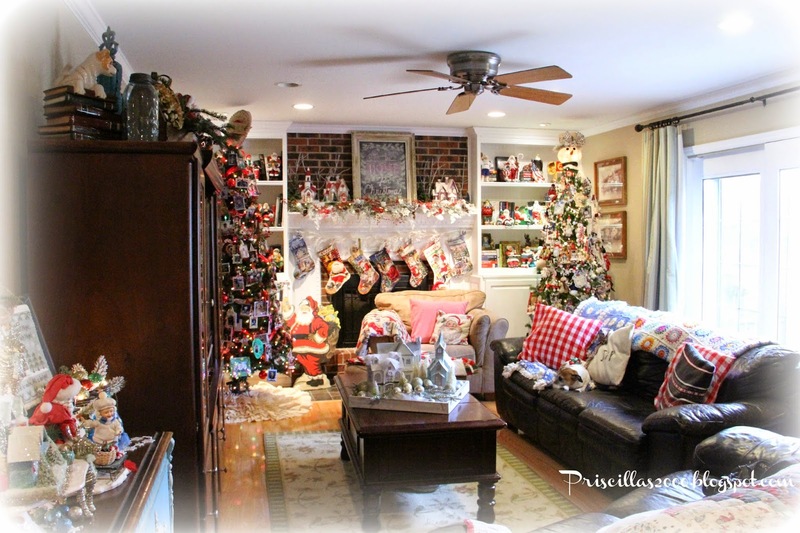 Your home should be on a Christmas Home tour! 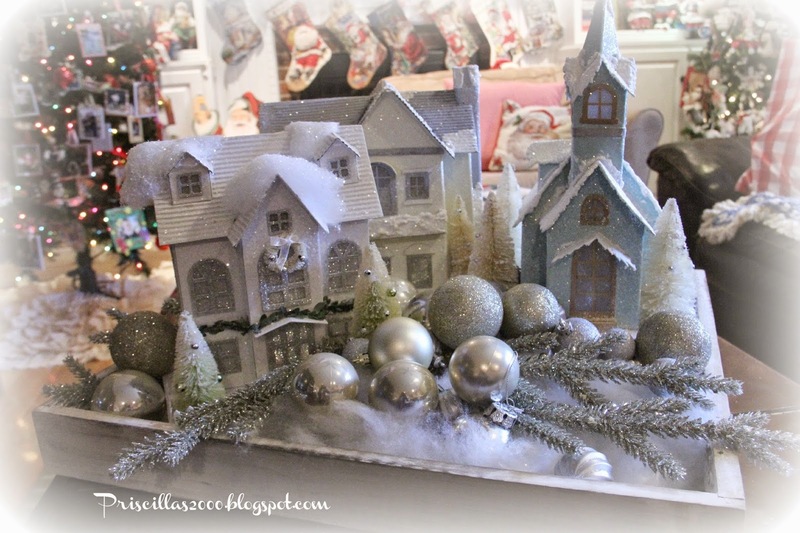 Your home is so darling and the perfect home to celebrate Christmas!! 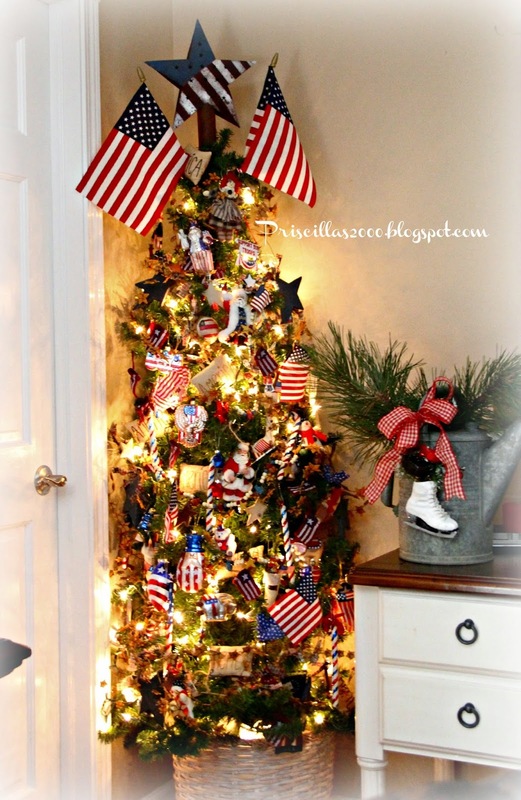 !I love your Americana tree! Priscilla, just catching up on your last few days postings. Your home is looking amazing!!!!! 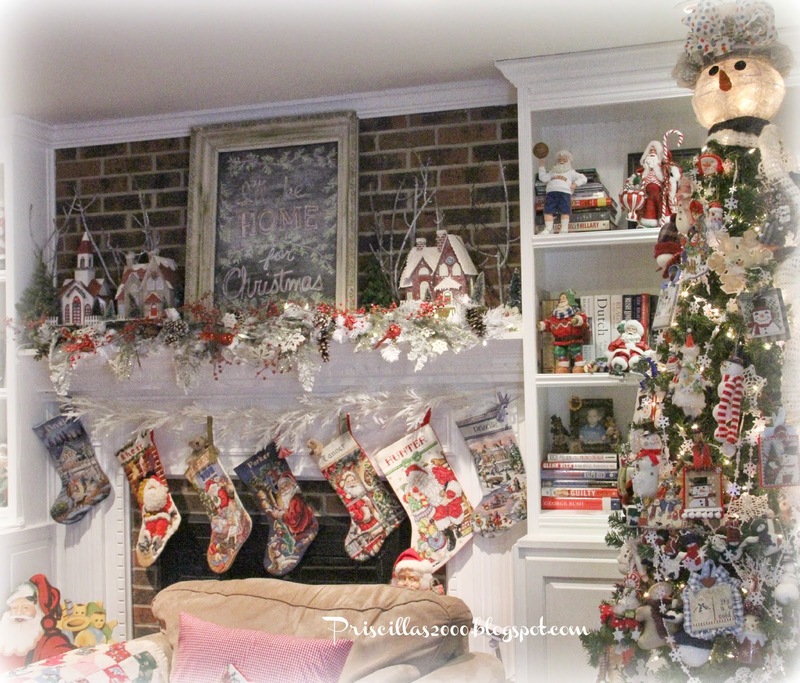 So many different styles of trees, love the little houses, cute santas, the cross stitch stockings are gorgeous and I love the snowman. In fact I have to say I love it all, and wouldn't want to put it away!!! I see now why you start decorating so early, there is just so much to see. I love everything you've created in your home.. What a wonderful atmosphere for your family to celebrate the Christmas/New Year season in.. Your Christmas spirit is everywhere.. Wishing you and yours a wonderful Christmas day/week and a happy, healthy 2015. How bright, cheery and festive! I especially like all of your santas! Have a merry! Oh gosh--another winner room! 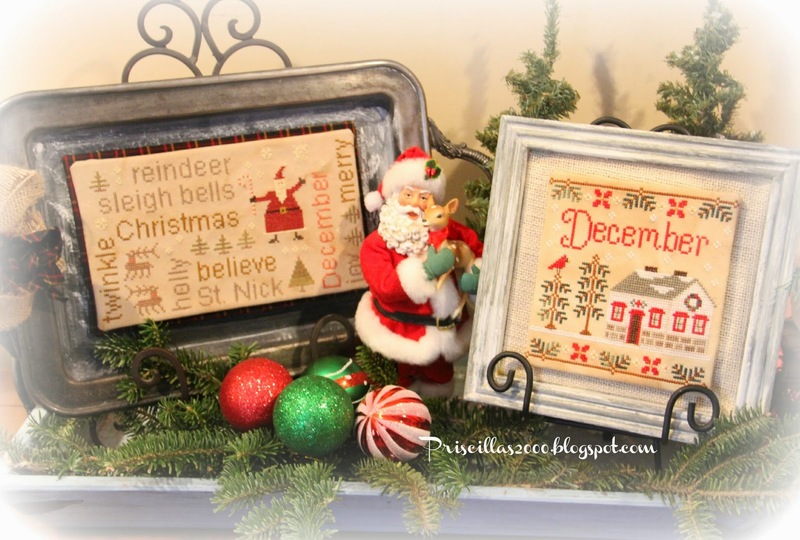 I have that Silent Night chart in my stash... perhaps soon it will be stitched! So many beautiful charts, but time just flies! 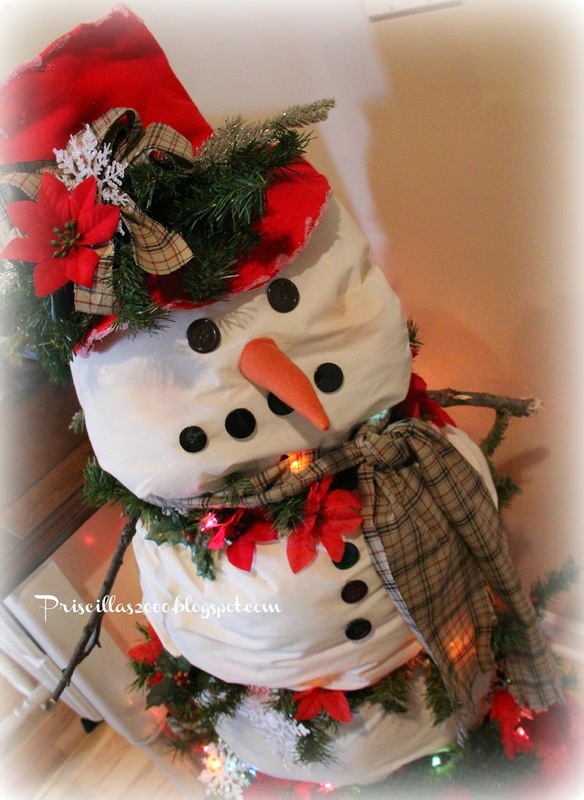 The snowman tree is pretty ingenius! The Americana tree is fabulous! Phew! Thanks for sharing it all with us!